He's been out since April 28 with a hamstring strain. 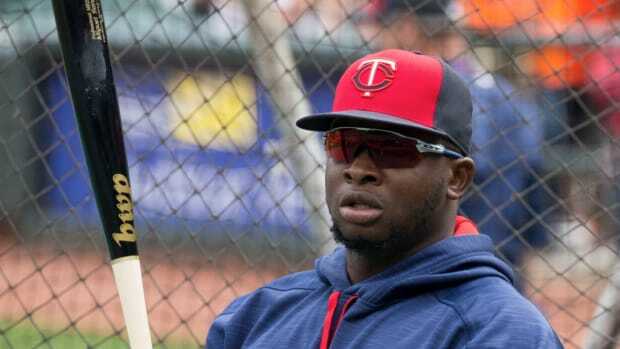 Miguel Sano took batting practice and did some running in the outfield before the Twins-Mariners game on Monday, but manager Paul Molitor didn&apos;t see enough progress to give a very positive update on Sano&apos;s recovery from a strained hamstring. "I think he still is a little tentative, for me, and how he&apos;s going about it," Molitor said, via TwinsBaseball.com. "I don&apos;t know how you would judge the level of effort he&apos;s giving on some of the running he&apos;s doing, but to me, it&apos;s not very close to 100 percent." Molitor said Sano looked fine in the batter&apos;s box and taking grounders, "but those hamstrings, like I&apos;ve said – to practice and try to get ready to where you can go compete in a game and then be able to sustain for nine innings, multiple days consecutively – that&apos;s a challenge with that type of injury." Sano has been out since April 28 with the hamstring issue, and he&apos;s already exceeded his stint on the 10-day disabled list (retroactive to April 28) and it sounds like it&apos;s going to take a bit more time before he&apos;s game-ready. Another factor that could slow his return to the Twins will be if he&apos;s sent on a rehab assignment for two or three games. Mauer is off to a terrific start this season while Dozier, Rosario, Garver, Kepler and Morrison have been really solid at the plate the last two weeks. He was approved for a rehab assignment at Triple-A Rochester. The hits keep on coming for the Twins. He could be back with the Twins in May. Another year and another story about Miguel Sano's shape. The decision comes nearly three months after he was accused. He's hoping to play next week.